This beautifully presented devotional book is just the right size for a purse or handbag, and offers mothers of all ages divine words of wisdom, hope, grace, and love. There is a short inspirational message for every day of the year. About "Inspirations For a Mother's Soul"
No one is more deserving of admiration, affirmation, and encouragement than mothers. Whether it's a simple expression of gratitude, a heartfelt word of thanks, or an acknowledgment of all of the selfless acts they perform on a daily basis, all moms want and need to feel appreciated and loved. In Inspirations for a Mother's Soul, moms are treated to divine words of wisdom, hope, grace, and love 365 days a year. 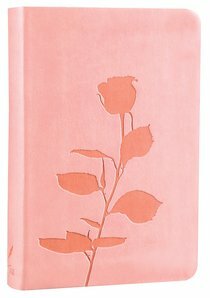 The perfect gift for Mother's Day, this beautiful LeatherLike devotional fits perfectly in a purse or diaper bag and provides moms with daily doses of encouragement, guidance, and assurance in readings short enough to finish in a carpool lane, during nap time, or in a rare moment of peaceful solitude - anytime, anywhere. Ellen Banks Elwell graduated from Moody Bible Institute and the American Conservatory of Music. She enjoys studying the Bible, teaching a few piano students, walking with friends, and taking beach vacations with her family. She has authored other books, such as The Christian Mom's Idea Book, When There's Not Enough of Me to Go Around, and a series of piano praise books. Ellen and her husband, Jim, live in Wheaton, Illinois, and have three grown sons, Chad, Nate, and Jordan.